Chaplain’s use a range of approaches to connect with students and build relationships, but one chaplain has a unique approach and it involves a very special helper. Here is a profile from the seventh edition of Experiri (Term 3 2014) and was contributed by Glenn Loughrey who was Chaplain at Lindisfarne AGS at the time. Experiri is a quarterly newsletter presenting stories of innovation in school ministry from Australia and beyond. Each edition provides two or three profiles of innovative strategies that have been developed in response to challenges or emerging issues for chaplains or others in Anglican Schools, including Heads and Religious Educators. Until now Experiri was an emailed newsletter but in the coming months some of the previous profiles will be posted here. At the time I was working in a Royal Australian Navy (RAN) accommodation centre for junior sailors in Sydney. As sailors go to sea for a long time they were not allowed pets, yet many were missing not only their families, but their animal companions. So Montgomery aka ‘Monty the Spoodle’ was recruited to take on the challenge of providing comfort, companionship and friendship. On moving to Lindisfarne Anglican Grammar School I was convinced of the value of a dog on campus and set about convincing the powers to be to allow him to attend the school one or two days per week. He was given a staff identity badge and a title – ‘Assistant to the Chaplain’ – and a uniform to wear, and commenced duties in 2010. 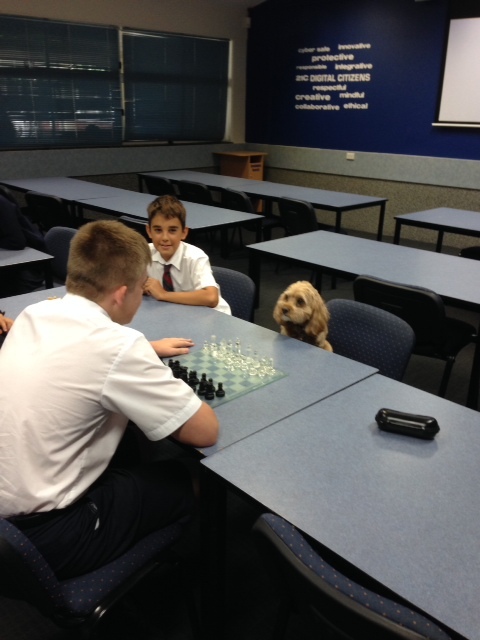 His primary role is to wander around the school with me and to engage with the students and staff. His mission: to be available and attentive to each young person and to spend time with them. His presence calms, relaxes and soothes students who are, for any reason, anxious, concerned or upset. Animals are very intuitive. They know how you are feeling and know when to engage and when not to. It is not unusual to find Monty and a student just sitting together away from everybody else simply ‘chillin’. The student is getting attention and giving attention unconditionally, and so is Monty. He will often appear to seek out certain students and find a way to interact with them. These can be students that we know are struggling but are yet to feel comfortable enough to speak to a chaplain or a teacher. At other times the presence of Monty provides an avenue to commence a conversation that has been hard to start for a range of reasons. Staff also looks forward to his visit to their office or workspace, classroom or staff room. His role with the staff is exactly the same as it is with students. He is also a school ambassador in the sense that he attends every ‘Principal’s tour’ for prospective students and their families. He makes an immediate connection with the young people, softening what can sometimes be a confronting moment for them. They now know someone at the school who will greet them in their first week here. They are not alone. The primary fear for the school had to do with work, health and safety issues but I have taken responsibility for those, just as I had in the RAN. It is important to note that not all dogs are suitable for this work. They must be a one-person dog, obedient and have had some basic training to work with people. Monty spent 10 days at a training facility as part of his adjustment to his new role when he joined the RAN.